I think the best way to understand different culture is to know ordinary people's way of life. We can show you real Japan while you stay in my house. We prepare home-made hot dishes to help you understand how Japanese enjoy everyday's meals. You will be able to know real Japanese cuisine by having same meals together in Japanese home. Since I was born and raised in Tokyo, I will be able to inform you about the things and sights which is not appeared in internet. Asakusa is one of the most famous sightseeing place in Japan. The residential area in Asakusa where I live is well known as an typical "shita-machi"area. People are living with helping each other here in shita-machi. And Asakusa is located in central Tokyo so the transportation is very convenient too . So you can enjoy both old Tokyo and modern Tokyo if you stay in my house. Please check the testimonials for the early days of our homestaying which is in the last part of this page. *Dinners, breakfasts, Utilities, heats and lights are included. > Meals are also served on holiday and weekend, it's included in the price. *Wireless LAN is available for free. I have official license to teach social studies but I haven’t worked at school ever before. I stopped to be a teacher as an occupation, and I made my own company instead. So if you have any question, I think I will be able to answer it from the surface and behind of matters. It will help you to know real Japan further. 2007: I started to run unique program called "A Little Bit of Japan" for helping tourists from abroad, The program shows you Japanese ordinary people's culture by offering unique activities. 2008: One of the popular TV program reported my activities on their morning show..
*"A Little Bit of Japan" program is still available for the guests who stay in my house. *Extra fee is needed. But it's almost real cost. Then, I have started to offer the upstairs of my house for the home-stayers. There are 1 Japanese traditional room and 1 western styled room. This was the starting year for our Homestay program. 2013: I added another 2 rooms for the guests. Because our home-staying program was becoming so popular. We already had many repeat customers in that year. Their numbers were much bigger than we had expected. The new rooms we started to offer are right next to our house. That house is standing at just "4 SECONDS" from the front door of main house. 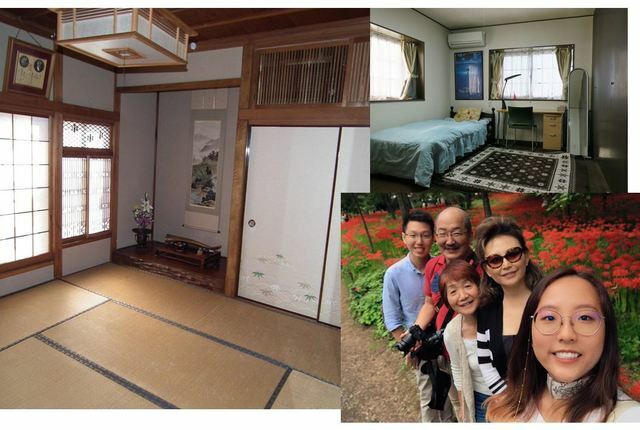 That house had been offered to Japanese tenants until we had decided to use the rooms for homestay. The case you will book that house, you are going to eat meals in the main house, spend some time with the other stayers in main house, and then back to your room in that house to sleep. You can enjoy both home-stay and apartment-stay style! 2015: We had to raise our homestay fee a bit because rising of consumption tax. 1) Wide Japanese room for the plural guests. 3) Standard Japanese room for single guest. We will welcome you to stay at my house. So please contact me if you are interested in staying at my house. If you would like to know further about us, please send me a friend request in Facebook. I will confirm it as soon as possible. Then, you will be able to see many photos of our guests and us in my facebook. *Becoming facebook friend is not required items, but booking priority exists in facebook friends and repeat customers. >> Exchanging Students, Interns, Gap-years travelers, Working holiday, Tourists, and so on. Long stay is the most welcomed because my homestay program is recognized by the health department as a Homestay bussiness . *Home stay bussiness is exempt from the regulation of hotel bussiness law nor Minpaku law. But, to follow the instructions of the health department about homestay, one month stay is needed at least. **Our homestay fee 98000 JPY for a month means about 3300 Jpy a night. To live in central tokyo in 3300 Jpy (with 2 meals, utilities, wifi and so on are included) is a good choice I think. >> My wife, I, and a cat. *Sons, daughters, grandchild, friends, and neighbors visit us often. Metro station: 5 minute walk(Minowa). JR station: 10 minute walk(Minamisenju). Bus stop: Only 30 SECONDS!! *Since my place is located in central Tokyo, you can enjoy huge city Tokyo efficiently and conveniently. *Sky Tree: About 2 km from my house. *Akihabara: 4th stop from the nearest metro station. *Shinjuku, Shibuya, Harajuku, Ikebukuro, Disney-land, Odaiba / 30minutes~40minutes by train. *Seven-Eleven (24 hours) convenience store: Just 10 SECONDS!! *Hospital, clinic: The nearest one is just 3 minute walk. I could not express my feeling how wonderful it was spending 12 memorable days (24 Dec - 04 Jan) staying with my host family during this festive season. This is one of my unforgettable festive celebrations. I truly appreciate and value the care, advices, hospitality from Hiro-san, Hideko-san and family. They perfectly make-up my home sweet Japan tour without regret. Special thanks to 'my-buddy' and Asakichi whom I really enjoy and glad to be with. You will be amazed with the simple but delicious home cooked food prepared by the host. I am touched when I am invited to join the 'special' home cooked lunch before I leave the next day. The most touching moment was on my last day. Hiro-san and Hideko-san prepared and packed warm breakfast for me and sent me to Asakusa Metro station direct subway to Haneda Int. Airport, helping me with my heavy luggages. It really saves me a lot of effort and time. It was 5:30am. Thank you again. The late night shopping, beautiful river walk opposite Tokyo Sky Tree under chilled wind, Sensoji-Asakusa hassle free night tour for unbelievable pictures, New Year celebration with the host family and guests until we forgot the time, superb Fujisan local private tour, just to mention a few. Most of these activities organized during this homestay program are from the hospitality of the host. I am so glad about it. Spend more time with the host and other members; start a conversation and I am sure that you will enjoy every moments. I did enjoy. I am missing my feeling as soon as I leave Japan. I did pick-up some Nihon-go and Japanese culture. Thank you very much to Hiro-san, Hideko-san and their family and other guests. We shall meet again. Thanks to Hiro-san's great hospitality, I had a very good time staying in Japan as a guest in his family. Hiro-san and his family were very kind and friendly to give me very helpful advice on how to travel around safe and efficiently. During that time, I had a great opportunity to try Kimono costume and traditional Japanese cuisines. And, the visit to the famous Fuji Mountain with Hiro-san's guidance had fulfilled my trip to Japan with an exceptional spectacle of the mountain from a specially secret place which was widely known only by local people. Had a week in Japan and my schedule was tight but I made a trip to Tokyo specially to visit Hiro and his family because they were such wonderful people. This is my second time staying with them this year. They brought me so much fun and laughter and cared for me. Hearing that I was taking Malaysian air, they tracked my flight, when I arrived they welcomed me with warm and open arms and even brought me to a beautiful place when I had a sudden change in plans! I am so grateful for everything. I can say that they are not my family by blood but they are family in my heart! Hiro and Hideko are wonderful hosts! While staying there, there was only one bad experience and that is having to say goodbye to such nice people. Hiro is a very knowledgable man and has introduce places to visit according to the things i like. For example, i was interested in Samurai and he introduced me the most beautiful castle i have ever seen in Japan. Hiro is also a very dedicated host he replies messages very quickly and never fail to help anyone one in need. Hiro also never fails to brighten one's day with his smile and jokes. Even when he is tired, he makes an effort to make put a smile on another person's face. Hideko is also a wonderful person. What touches me most is that when i had to leave the house very early, she would wake up earlier to prepare hot breakfast for me even though she sleeps late at times. In addition, she is a very good cook. In my opinion, i think the food she made is even better than most restaurants in Tokyo city. In fact, Hiro and Hideko are not just hosts, they are like family and they treat each guest as such. No words can express how great they are and i am very glad to get to stay with them. A return trip goes without saying. In addition, location is also very convenient, it is about 5 minutes to the nearest subway station. On a bike, it is possible to cycle all the way to Akihabara, Ueno, Asakusa and many more places. With wonderful hosts, delicious meals and a good location all for a reasonable price, i would recommend anyone to stay here! Hiro's and Hideko's homestay..I already had the chance to be welcomed by them twice the last 12 months. This is a traditional and open-minded familly. Hiro knows a lot about Japan history and takes time to explain Japanese culture. Hideko is a very good cook. 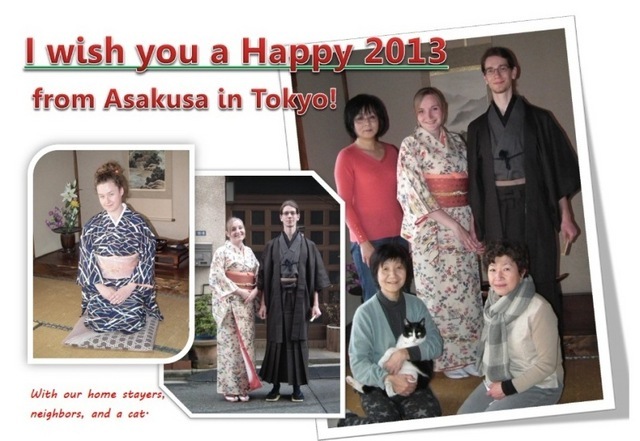 I strongly recommand this homestay to those who are looking for a Japanese immersion. I enjoyed the warm hospitality Hirosan and Hidekosan provided during my several times in Japan. I love the activities we do together as a family. The highlight is the delicious dinners prepared by this beautiful couple. I highly recommend to stay at Hiro's. He will show and teach you the rich Culture of Japan! They will help you with anything, or suggest places to must visit,... Last year I went there for the 1st time, I had no plans, I'm spontanious about choosing what I want to do, They brought me last year to Matsumoto castle, it was really nice, then they had fixed me a busride very cheap, to Kyoto, hanged there a day around, then took the JR to Kobe (Sannomiya) went to eat some Kobe beef, so delicious, slept at a manga cafe and next day my busride was fixed to get back to Tokyo, it's fun because it's different then just taking the shinkansen to get so far. A really must go to homestayfamily, it's my Japanese family to me :D. Friendly, kind,... family, you have to stay at this place and see how wonderfull they are. Soon I'm visiting them for the third time ^-^ See you soon Hiro-San!! Japan is always is in my memory, specially memorable hospitality by Mr. Hiro and tasteful japanese food by his wife, Feeling homely during my stay with Hiro's family. I appreciate for their great service, Hope to see again with this family. The best of Japan together with an amazing family is what you will get if you decide to stay with Hideko and Hiro. I chose to stay with Hiro and Hideko while studying for half a year at the University of Tokyo. Hiro speaks English very well, and he is able to help you with just about anything. He helped me with a lot of practical issues while staying at their house. He joined me to the city hall to help me obtaining my residence card. He helped me with finding the best and cheapest way to get to and from school. He helped me creating a bank account in Japan, which is not as easy at it might sound like. Hiro could, and still can help me with anything that I am wondering about. Most people in Japan do not speak English, which can make it difficult to deal with practical issues. Hiro was of much help during my stay. Both Hiro and Hideko want the best for their guests, and I think that is why they are as nice and helpful as they are. Staying at their house also give you the opportunity to meet other guests from different nationalities. During my stay I have met people from USA, Canada, Nepal, China, Korea, Singapore, Tahiti, and Austria. It has been a good life experience to be able to meet so many different people with different backgrounds. You may also be able to meet other friends and family members of Hideko and Hiro. If you stay long enough as I did, you will be able to get to know them too. The food you eat with the family is typical Japanese food, and it is delicious. Having breakfast and dinner made for you every day makes you spoiled. It is also good for those who want to spend much time travelling in Japan, as the family make breakfast according to your schedule. Even if you are staying in Tokyo for just a few days, or for a longer period of time, such as myself, I highly recommend staying with Hiro and Hideko. They have become my second pair of parents, even though Hiro insists on being my younger brother. Hiro san and Hideko san made my trip to Japan one of the best moments in my life! They were kind and friendly people who helped me a lot during this first trip to Japan. I learned a bunch of things all thanks to Hiro san and Hideko san cooking is superb too! Hiro san also brought us all over the area during his free time! Also, their cat, Asakichi, had been such a cute cat. Everyday was a memorable day with them, along with the fellow guests of theirs and I felt as though I am already part of their family! The house was cozy and convenient, 7-11 is just a stone throw away and there is a public bath if anyone felt like trying one! If I were to pop by Japan again, no doubt I will choose to stay at their cozy warm home again. My stay at Hiro San and Hideko San's home in Tokyo was one of the most fondest experience I have ever had. They are both very kind, caring, sincere and thoughtful people. I was very spoiled by Hideko San's yummy cooking everyday and I am still longing for those Japanese breakfast made by her! Chatting with Hiro San about everything related to Japan was thoroughly interesting and enjoyable, and I have learned a lot from him. Their cozy home is well located and very easy to find. An icing on the cake was the great "Sento" right across the street from their home. I loved that place...it is a not to be missed if you want to have some authentic Japanese experience in Tokyo. Everyday there at their home was a wonderful, memorable day. I would highly recommend a homestay at Hiro San and Hideko San's home and I would return there in a heartbeat without any hesitation. Oh and don't forget to say hi to Asakichi San for me when you are there ^0^. Though I stayed only a few days in november 2013 at Hiro & Hideko's, I could experience and highly appreciate a true japanese way of living. Thank you for your kindness, helpfulness and hints that turned my first stay in Japan the best experience of my life. We had the chance to visit some places the way japanese would do. And Asakusa area is one among the most convenient places in Tokyo. I hope I can go back there for a longer stay asap. When I got firstly to Hiro and Hideko's house, I thought that only 2 weeks in Tokyo for meeting them and their huge city would be a very short time. But I made a mistake, with their help I met very very nice places and the most important thing was that I found one of my closest friends beside the language and culture, I felt like they were my Japanese parents. I can't wait to visit them and share all those good memories again. The first time I though to go visit Tokyo, I was worried about homestay because Japanese culture is a really different and special one. But Mr. Naga and his familly made it really easy and enjoyable. He and his familly are so nice and kind. His house is in an amazing location. Close to metro station and SkyTree tower. I was staying with Hiro, his wife Hideko and Asakichi the cat for 5 months and in this time this place got to be a second home to me. While you can have your own free space if you want, you can join them for several things and occasions like sento (japanese public bath), festivals, traditional japanese music performances, shopping, trips in and around Tokyo and many more. They will show you around and explain everything what might be strange to you. They will help you with bureaucratic stuff, sending letters and packages and will take you to the hospital if you're ill.
Now about food. You get typical Japanese homemade cooking for breakfast and dinner. Althought it might be strange for some people from Europe or America to have rice or fish for breakfast, it is very tasty and you will get used to it very soon. I also learned how to hold chopsticks the right way.